The EMS 3500 Thermocirculator is a low cost, portable water circulating system for supplying a constant temperature supply for closed and open loop applications at near ambient to +60°C. glandless magnetic pump, through an aluminum reservoir. A cooling coil is mounted in the liquid reservoir. This coil can be directly connected to the main water supply and is primarily used when temperature control near to ambient is required. The electronic control system features a zero voltage switching unit which minimizes mains electrical interference, enabling the EMS 3500 to be used and sited with other sensitive electronic instruments. 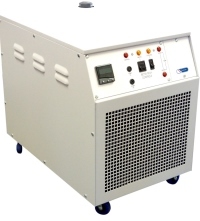 The EMS 3500 will give controlled heating of EMS 3100 Critical Point Dryer. It is connected directly to the inlet and outlet of the EMS 3100 water jacket. The temperature of the circulating fluid is pre-set, typically set to 37°C (eg just above the critical temperature of carbon dioxide). Size (unpacked) 330 x 280 x 150mm / 13 x 11 x 6"
Recommended for open and closed loop applications, offering simplicity, reliability and quiet operation. The range includes the EMS 4860, 4870, 4880 and 4890. Many instruments measuring physical properties depend on accurate control of temperature and in some processes optimum temperature is essential. With the EMS 4800 series, over-cooling (which affects efficiency) is prevented and the water temperature can be accurately controlled over the range -10 to +60°C. A commonly misunderstood feature of refrigerated systems is in applications where the control temperature is other than at or near room temperature. When the instruments are to be operated at controlled temperatures below ambient, the extraction deteriorates significantly and, as a guide, the compounded change is 4% per degree Celsius. In practice, the refrigerant gas pressure has to be adjusted to optimize the performance at any particular temperature. However, the EMS 4800 series incorporate automatic adjustment valves in the systems. compared with open bath models. They are simple to set up and to operate, and essentially maintenance free. Flow rate x weight of fluid x specific heat x D T = Heat Extraction. NOTE: Larger capacity heater/chillers (6kW and 12kW) are available on request - please contact us for further information.